Last weekends and for the past couple of days, I spent most of my daytime fixing my Yamaha TZM. Somehow I regret letting that ‘someone’ tuning the bike. In the end, I spent most of my off days fixing it back. What happened was, last Saturday morning I took my bike for a weekend ride around town. While going back home that afternoon, I noticed a little power loss and the power valve a little bit late to kick in when reaching 120km/h on the highway. I thought the carburetor fuel-air tuning might be off somewhere. So, back at home I decided to tune the carb and that’s where that ‘someone’ offer himself to tune it…and that’s where I made a big mistake. He said he knew how to tune a 2-stroke bike, clearly he’s wrong. He know nothing about tuning a Yamaha TZM. After several attempts, he overheated the bike and I tell him to stop tuning it or everything will get worse. Yet, the bike is still nowhere to start and run smoothly. Every time it revs higher then 3000 rpm, the engine shuts off. 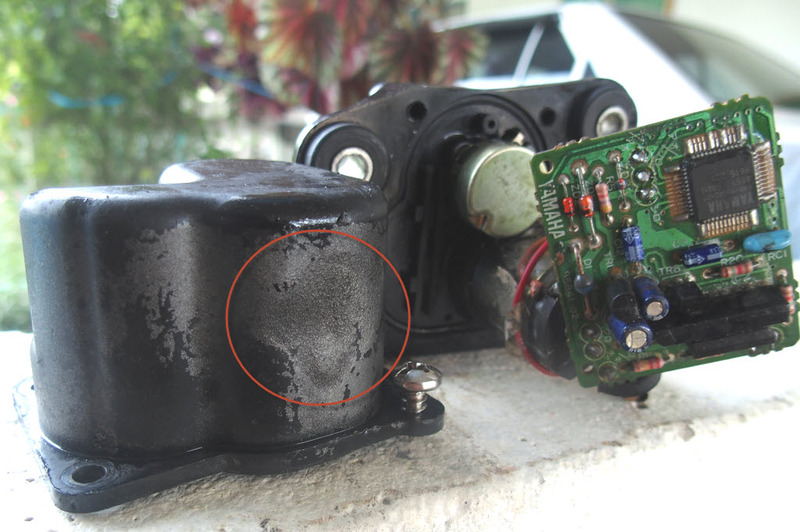 For a Yamaha TZM owner, it is easy to detect if the servo motor is not functioning properly. 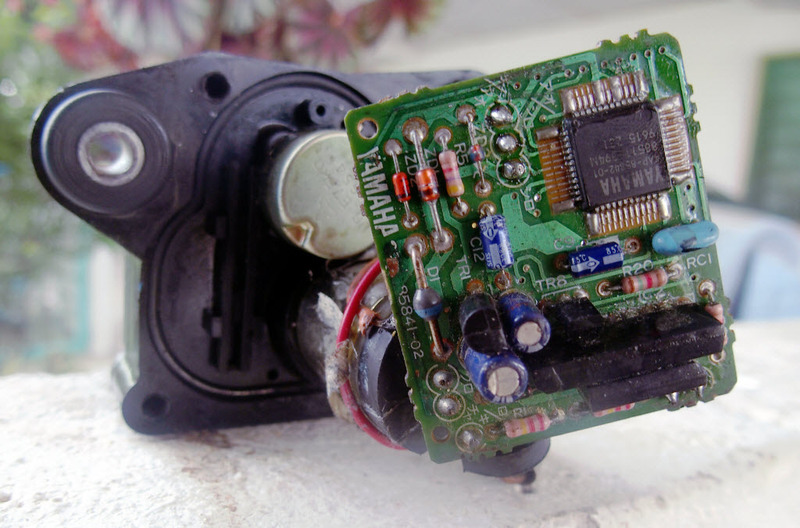 When you turn ON the ignition switch, if there is no buzzing sound come from the servo motor, that means something is wrong with it. For this case, the buzzing sound of the servo motor is cut short and did not complete a full cycle valve opening sequence. Looking from the front, there seems noting was wrong to the unit. Wait until you see the other side of it. Inside the servo is this Yamaha YPVS control circuit. These circuit doesn’t have any heat sink. Notice that dent? That is the burn mark caused by the control circuit went overheat. Lesson of the day, do not assume and trust just anyone to tune your bike. Make sure they know what they’re doing and they have experience handling the same bike model. I drill some small holes to help the heat escape from the casing and add some airflow to the circuit board, but also risking it by exposing it to water splashes. After some minor modification to the power servo motor and lubricate the gears, it finally works perfectly. If this unit spoils, it will cost me at least RM650 to get the original Japan replacement unit, or around RM500 to get the made in Thailand or Taiwan replacement unit. When revving the engine too long with less or almost no fast moving air into the carburetor, it will effect the reed valve. 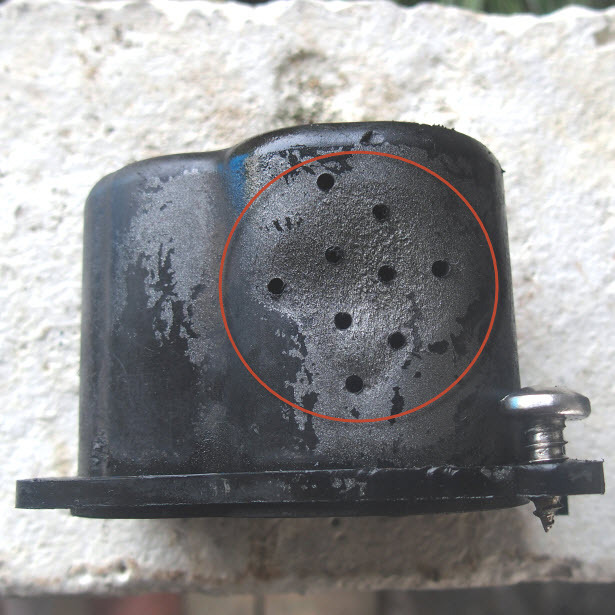 The constant revving will vibrate the reed valve into an open-close motion in a very high speed phase, but without proper air flowing from the carburetor, the heat and vibration will cause the valve membrane to refuse to shut properly. 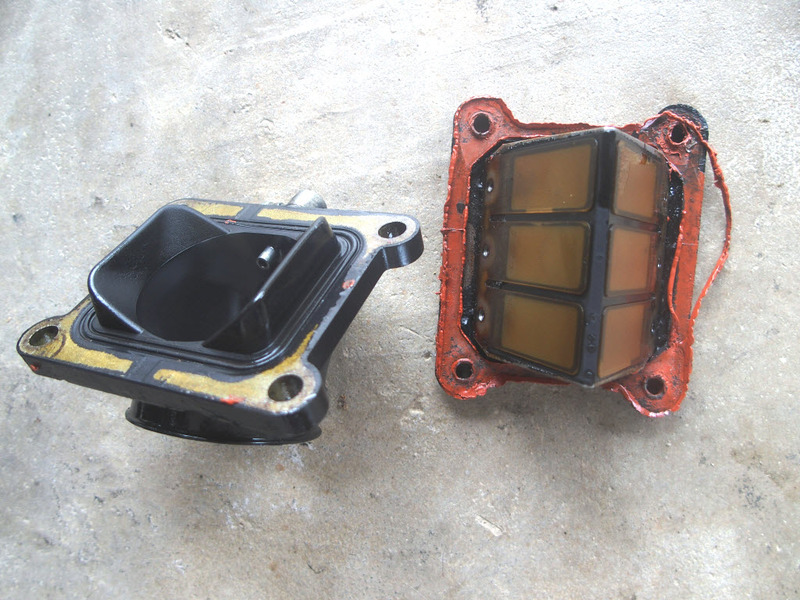 The valve membrane is a thin layer of plastic material that control and prevent the intake air-fuel mixture to flow back inside the carburetor. 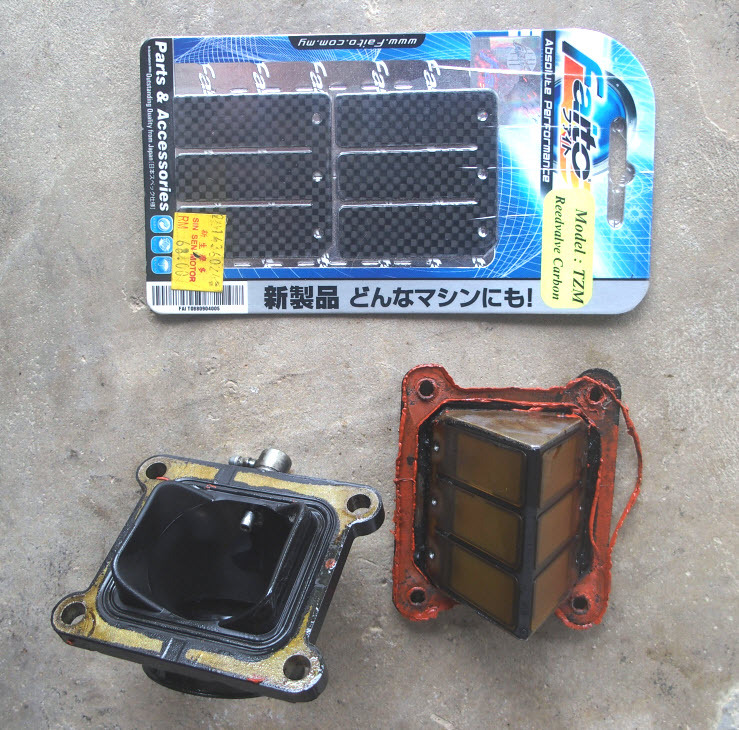 Yamaha TZM 150 reed valve have 3 flaps where the RXZ and the 125Z only have 2. Suzuki TXR also only have 2 flaps. You can see from the above picture, the original reed valve membrane is very thin. For my case, one of the membrane flap was not closing. It wasn’t lay flat on the valve base and the air-fuel mixture kicks back into the carb. What happened if this thing happens to the valve reed? The engine will shuts off every time you throttle your bike. The burning process only sufficient to start and rev the engine, but doesn’t have enough power to throttle it away. There’s a power leak in the reed valve. What to do next is to replace the reed valve membrane. I replace the old membrane with Faito carbon membrane. More thicker and durable. Top and side view of the reed valve with carbon membrane. A normal reed valve membrane maybe costs me around RM30 – RM40 for replacement, but I was looking for something more durable and can be used for a long distance ride. That’s where I opt to buy the Faito carbon membrane. This one cost me RM60, which is double the price of a normal membrane. 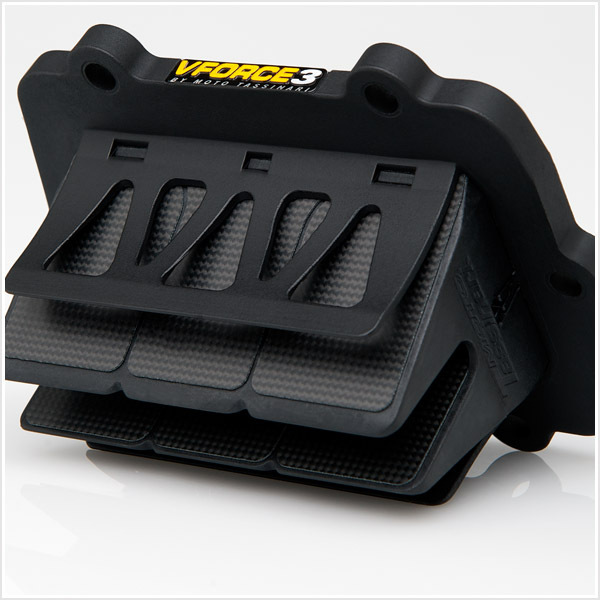 Another option is to upgrade the reed valve to a better performance reed valve unit like the MotoTassinari VForce3 / VForce4 Reed Valve System. This new system easily costs around RM500 – RM600 to upgrade. After 3 days of modding, servicing and testing, the legendary Yamaha TZM finally running good. I’m waiting for a good bright day to bring the bike for another long ride and check how well the re-servicing goes. Oops, I’m sorry.. Not the pv, I mean the YPVS control circuit part. 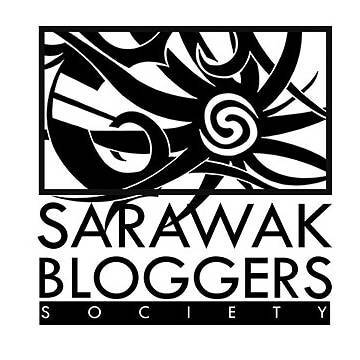 Hi Nazreen, thank you for the idea. Actually, it did cross my mind to put a heatsink on the chip. i wanna try the phyto carbon membrane… where to buy them? Hi may I know the sizes of your current carb, main jet and pilot jet? My bike is using Keihin 28mm carb with stock main and pilot jet. Hi, Eone. I don’t think there is a Vforce module for this bike so far. 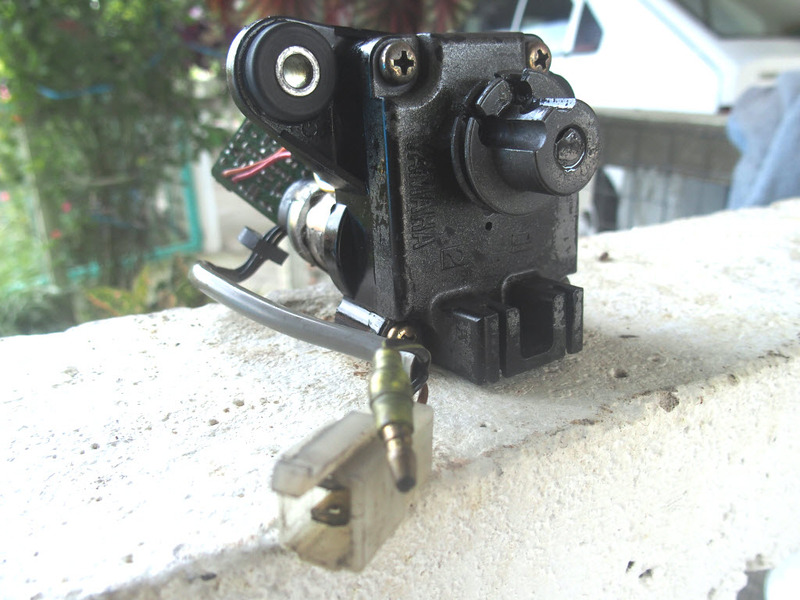 My TZM power valve servo motor is totally not working. Do u know where I can get 1?